Definition at line 300 of file activex.cpp. Definition at line 485 of file activex.cpp. Definition at line 1144 of file activex.cpp. Definition at line 711 of file activex.cpp. Definition at line 938 of file activex.cpp. Definition at line 892 of file activex.cpp. Definition at line 988 of file activex.cpp. Definition at line 884 of file activex.cpp. Definition at line 1150 of file activex.cpp. Definition at line 777 of file activex.cpp. Definition at line 746 of file activex.cpp. Definition at line 687 of file activex.cpp. Definition at line 720 of file activex.cpp. Definition at line 839 of file activex.cpp. Definition at line 857 of file activex.cpp. Definition at line 821 of file activex.cpp. Definition at line 660 of file activex.cpp. Definition at line 616 of file activex.cpp. Referenced by Display_DestBlt(), Display_MemBlt(), Display_PaintBitmap(), Display_PatBlt(), Display_Rect(), Display_RestoreDesktop(), Display_ScreenBlt(), and Display_TriBlt(). Definition at line 629 of file activex.cpp. Definition at line 606 of file activex.cpp. Definition at line 678 of file activex.cpp. Definition at line 1120 of file activex.cpp. Definition at line 1099 of file activex.cpp. Definition at line 740 of file activex.cpp. Definition at line 666 of file activex.cpp. Definition at line 759 of file activex.cpp. Definition at line 525 of file activex.cpp. Definition at line 304 of file activex.cpp. Definition at line 1166 of file activex.cpp. Definition at line 356 of file activex.cpp. Definition at line 313 of file activex.cpp. Definition at line 371 of file activex.cpp. Definition at line 482 of file activex.cpp. Definition at line 481 of file activex.cpp. Definition at line 478 of file activex.cpp. Definition at line 479 of file activex.cpp. Definition at line 480 of file activex.cpp. Definition at line 516 of file activex.cpp. Referenced by Display_BeginUpdate(), Display_DestBlt(), Display_DrawGlyph(), Display_EndUpdate(), Display_Line(), Display_MemBlt(), Display_PatBlt(), Display_Polygon(), Display_Rect(), Display_ResetClip(), Display_ScreenBlt(), Display_SetClip(), and Display_TriBlt(). Definition at line 519 of file activex.cpp. Definition at line 520 of file activex.cpp. Referenced by Display_PaintBitmap(), Display_RestoreDesktop(), and Display_SaveDesktop(). Definition at line 522 of file activex.cpp. 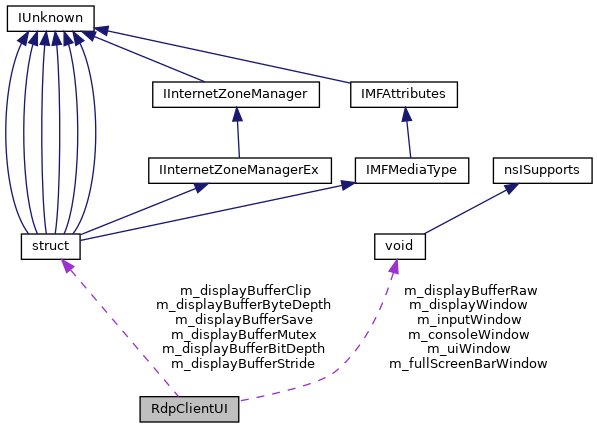 Referenced by Display_ResetClip(), and Display_SetClip(). Definition at line 515 of file activex.cpp. Referenced by Display_PaintBitmap(), Display_ResetClip(), Display_RestoreDesktop(), and Display_SaveDesktop(). Definition at line 523 of file activex.cpp. Referenced by Display_BeginUpdate(), and Display_EndUpdate(). Definition at line 517 of file activex.cpp. Definition at line 518 of file activex.cpp. Definition at line 521 of file activex.cpp. Definition at line 514 of file activex.cpp. Definition at line 513 of file activex.cpp. Referenced by ConsoleWindowProc(), and Display_RepaintAll(). Definition at line 470 of file activex.cpp. Definition at line 1164 of file activex.cpp. Definition at line 1163 of file activex.cpp. Referenced by ConsoleWindowProc(), and UIWindowProc(). Definition at line 368 of file activex.cpp. Definition at line 369 of file activex.cpp. Definition at line 483 of file activex.cpp. Definition at line 367 of file activex.cpp.